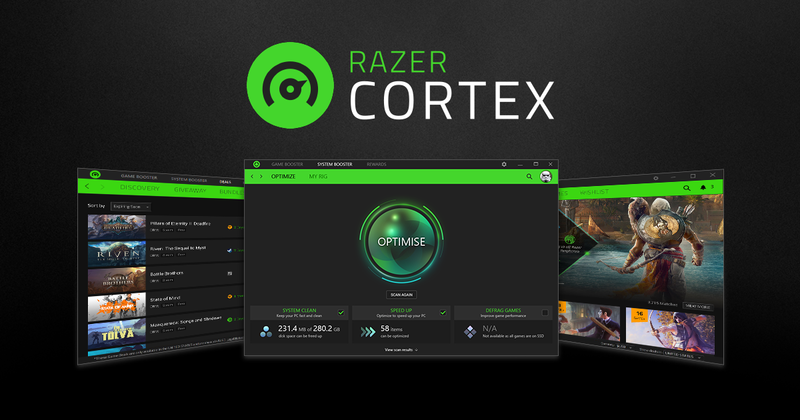 Razer Cortex is an app that is designed to boost the entire performance of your computer when you are gaming. Although the emphasis of the program is to deliver better gaming by reducing load time and giving higher FPS, it also gives other solutions to your overall PC as regards performance. No matter what you are doing on your computer, there are always background programs that are always running. What these do is that they limit the gaming performance while also putting pressure on the computer. It is because of this that game boosters such as the Razer Cortex are popular. Generally, game boosters work by limiting the background operations on your computer when you begin playing games. This is important since games need as many resources as possible. Therefore, the boosters serve to take the load off the CPU and free up the RAM while reducing disk activity. While there are many other game boosters such as Game Fire, IOBit Game Assistant, and ToolWiz Game Boost, the Razer Cortex game, and system boost is one of the most used. What is Razer Cortex Game, System Booster? As indicated, the Razer Cortex game booster is a program that serves to give you an improved gaming and PC performance. It functions by managing or even killing processes and other programs that are not needed when you are gaming in order to take off unnecessary load on the resources. Before anything else, maybe we should point out that Razer is not only a big name when it comes to gaming computers, phones, and other peripherals, but it is also famous for different programs that enhance games in different ways. It is consequent to this that Cortex has become widely used. The way that Cortex function is by ensuring that you get higher frames per second (FPS) as well as smoother gaming performance by freeing up your needed resources such as RAM and CPU. The program is available for both your phone and computer, and it is pretty simple to use. Does It Work, Is It Good, Safe? When it comes to usage, it is pretty much very easy. All you need to do is to have it downloaded from Razer’s website where you will find it available for both PC and mobile phone; Android. Once it has been downloaded and installed, the next thing that you will need to do is to add games to your library either through Steam or any other client. While it is mostly for gaming and system boosting, the Cortex game booster also has some features that allow you to do a lot of things including capturing in-game activities and customizing your game. When it comes to the question of whether the app works or not, it is easy to point out that the app works pretty well. In the Razer Cortex Boost section, you can either tweak, boost, or select the defrag options. What is more, is that the app works on all computers higher than Windows 95. Game Booster: Using this tool, you can decide the processes and services that you want to stop when you start gaming so as to enhance the performance of your system. Once you click the option, you can enable or disable different processes. TWEAK: This is a tool that you can use to adjust the settings of your PC to get more performance during gaming. Without needing to make any adjustments of your own, you can simply click on the OPTIMIZE button to make use of Razer Cortex’s recommended settings. If you want to tweak it based on what you want, simply select Custom and from there, you can select or deselect what you want or do not want respectively. When you are done, simply click on the OPTIMIZE button. BOOST: This serves to directly start boosting your game by suspending other computer activities to give more resources to your game. Once it is toggled off, the normal computer activities and services will be restored. You can either use the custom or recommended settings. If you are using the custom settings, you will need to be careful because suspending some processes and services may affect the functioning of your system, hence if you are not sure, you may as well use the recommended settings. DEFRAG: What this tool does is to defragment your games in order to make them load smoother and run faster. To use the tool, simply click on DEFRAG in the program and then select the game. Before then you will need to add the games you will want to defragment by clicking on Configure. That said, the booster does not affect your hardware changes. Instead, what it does is centered around things like the processing strength and the memory of your computer. As a result of this, the safety of the program is not something to be brought to question. More so, it has not been associated with anything such as virus and malware or anything that will put your system at risk. Finally, as noted, the app works greatly by launching your games much faster than they would normally launch and making them run better and smoother. How best the app works for you ultimately depends on your settings but you are sure to have better gaming and general computer performance. Is Razer Cortex a Virus? In various security tests, Razer has not been found to have any form of virus or malware. This means that the program is neither a virus nor does it bring any virus, malware, spyware, trojans, or any security risk to your computer. While it comes with very useful features and tools that improve the performance of your gaming and computer as a whole, the app is completely free to download and use. Which Game Booster is the Best? Because it is able to cut down loading time significantly and give smoother motion thanks to the better FPS that you get, the Cortex is one of the best boosters that you will find out there. However, there are also others that will serve greatly such as Advanced System Optimizer, Wise Game Booster, and Mz Game Accelerator.